Whilst cruising the waters of Neko Harbour with Quark Expeditions, we were intercepted by two curious Minke whales who got very close to our zodiac, and circled us for 10 minutes! Minke whales are some of the most gracious and intriguing animals we’ve encountered in all our travels. We spent a magical time as they slowly grew more confident and came closer to our zodiac. At some points they were less than a metre away from us, and we could see them below the surface of the crystal clear waters of Antarctica as they checked us out. And then of course when they surfaced we saw more of them as they rose and fell back into the calm waters around us. Words do not do it justice, so check out our (shaky) raw footage as our interested Minke whales swam around us! This was one of our favourite moments in our time in Antarctica, and we headed back on our zodiac to the ship in awe of what we had just witnessed. This sums up Antarctica for us, you never quite know what you’re going to experience each day. We we’re zooming around the waters looking for interesting icebergs and penguins, and then all of a sudden two Minke whales decide to change our plans! Even when you set foot on Antarctica, plans can change quite quickly as well! 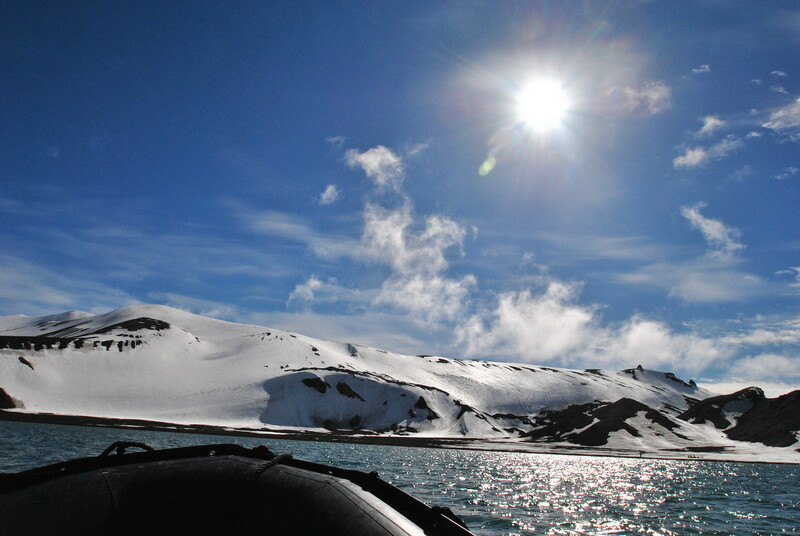 When we visited Deception island, an old and abandoned whaling station set on a volcanic caldera (honest! ), we had no intention of completing the Polar Plunge, a famous icy run and dive into the waters of Antarctica. But guess what? We took on the Polar Plunge, and won! Check out the video in our article there! Barry actually had to complete it TWICE as the first video didn’t quite work – talk about dedication! Loving your ‘whales of antartica’ video. Amazing! Thanks Euan! Glad you liked it!